I have never hid my love of hops. The complex aromas and flavors that waft off of a good hoppy beer are unparalleled. However, there are three primary ingredients to beer, and I am starting to give barley malt a bit more credit. Without doubt malt is the backbone of beer. One of the first steps in the brewing process, long before you have to worry about hops or yeast, is breaking down the complex plant sugars into something that the yeast can eat. The malt you choose also affects the flavor and color of the finished beer. Light malts for clear golden pilsners, dark heavily roasted malts for hefty stouts. So if malt is versatile and indispensable, why have I been known to look down my nose at malt-forward beers? Like anything, used incorrectly maltiness can be a bad thing. The road to beer hell is paved in malty good intentions. Great beer demands balance, and unbalanced malt forward beers can be sticky, sweet, and cloying. At the Keyaki beer festival one year we had a stout that tasted like a Coca-Cola, thick and syrupy. These are not adjectives you want describing your beer. My fear of cloying beers has been alleviated by a string of fantastic malt heavy German beers. Starting things off was the Mad Capper reviewed Shlenkerla Eiche. Dopplebocks can be major malt offenders, but this one was amazingly balanced with the sweetness being offset by the smoked flavors. Between the many layers of malt and the smokiness, the beer was amazingly complex and nuanced in ways that surprised me. The next beer in line was the Weihenstephaner Vitus, which took that surprised and blew it out of the water. Vitus is a Weizenbock, which is a strong dark wheat beer. Beers made with wheat tend to be lighter, summery sorts of things. This monster was dark, and rich, with notes of dark fruit and apricot from the roasted malts mixing with the traditional clove and banana flavors of a Bavarian wheat beer. What was so interesting was that instead of clashing, all of these flavors supported each other. I suppose when you have been brewing beer for over a thousand years you get pretty good at it. Just this past weekend I got around to popping open a Celebrator, from Ayinger Brewery which is located just a bit south of Munich. As you may remember from a few weeks ago, the brewing monks of Paulaner created the dopplebock style as a liquid bread to sustain them during Lenten fasting. This brew was named Salvator, and so most of the subsequent dopplebocks have tacked an -ator onto the beer name. 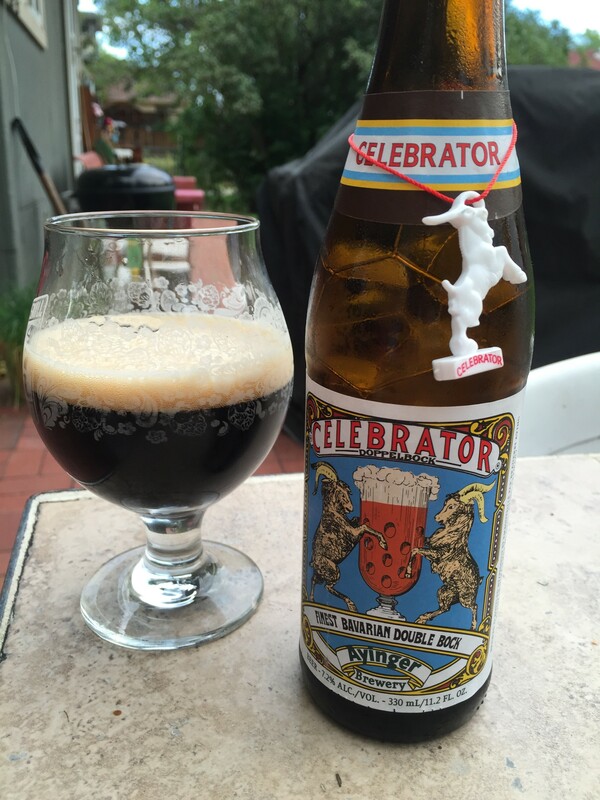 As an interesting side note, the goat theme you see on the Celebrator and many other bock style labels is a bit of a pun. Bock is both a style of beer and a German word for goat. What I didn’t know when I bought and opened it was that Celebrator is the top rated dopplebock on Beer Advocate. It takes a lot to become a number one beer, and this one really brings it all to the table. It is rich and layered, with plum and grape flavors that remind me of heavy and filling German bread. Luckily dopplebocks are lagers, and the cleaner crisper yeast character helps lighten the malt. This means the beer is both complex and massively drinkable. While I am still a hophead, I am growing to appreciate the malty side of things thanks to these fantastic German beers. Hopefully as American brewers start to experiment and find new styles to update and make their own we can find more and more of these sorts of beers. What are your favorite malt-forward brews? What should I try next? Let me know! This entry was posted in German Beer and tagged Ayinger, Bock, Dopplebock, Paulaner, Shlenkerla, Weihenstephaner, Weizenbock. Bookmark the permalink.